Drop earrings with vintage beads. New drop earrings made from genuine vintage beads and components . 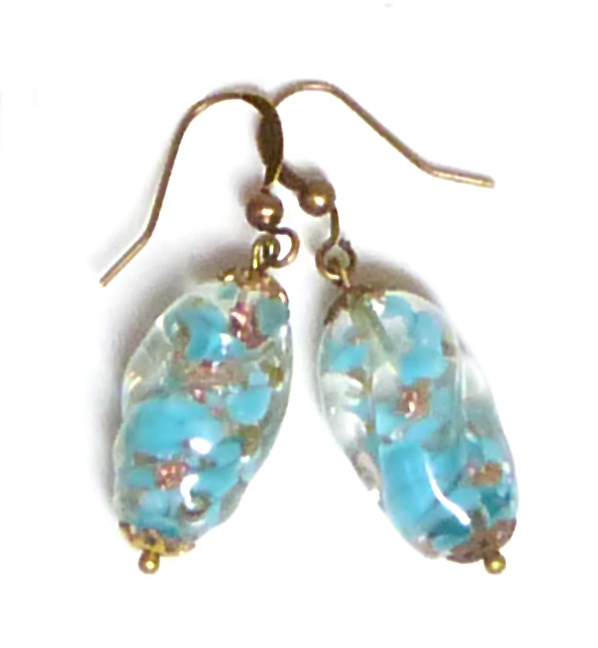 Each of these earrings consist of a single fabulous quality, vintage Venetian Sommerso lozenge shaped clear glass bead, swirled with clouds of aqua glass and with a liberal sprinkling of sparkly aventurine. They have a lightly chiselled surface so catch the light beautifully and have pretty period brass beadcaps. They are hanging from new bronze coloured brass ear wires. These beads are in excellent vintage condition. Because they are individually hand made, they are not identical, but clearly go together. From the bottom of the ear wires, the earrings measure approx 2.5 cm. The bottom bead measures approx 1.2 cm in diameter at the widest point.